Description and examples of the important abnormalities in the liver region that the advanced IMBUS provider should identify. Hepatic congestion: Elevation of right heart pressure from any cause, or thrombosis of the hepatic veins (HV) (Budd-Chiari), will lead to congestion of blood in the liver. This leads to widening of the HV and hepatomegaly with a reduced echogenicity of the parenchyma. The confluence of the HV with the IVC can resemble a “bunny” as the structures enlarge. 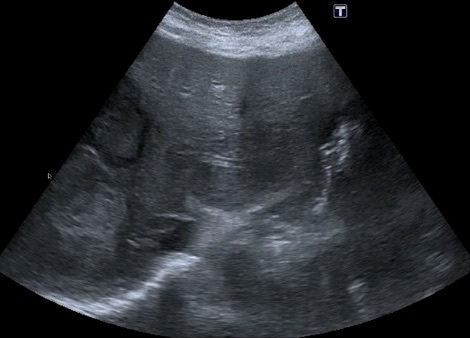 Pleural effusions and ascites may be seen in such patients. Color flow Doppler (CF) can determine whether there is flow in the HV and regurgitant flow from tricuspid regurgitation may be seen. 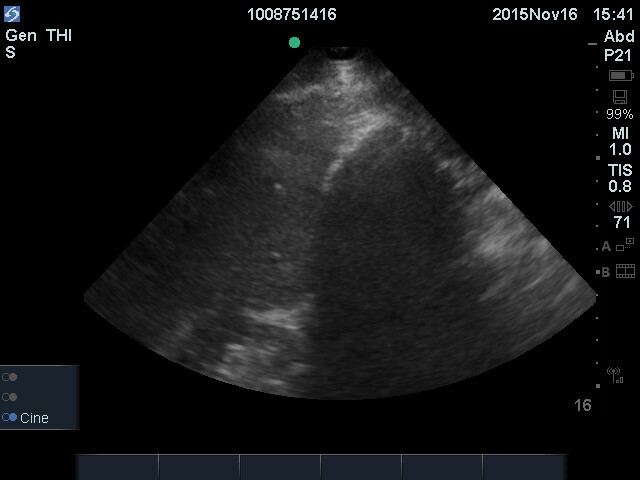 Chronic thrombosis in HV usually is seen as an echogenic area in a vein that obstructs flow. The following is an example of elevated right atrial pressure from tricuspid regurgitation leading to dilated HVs. Hepatic steatosis (fatty liver): This is common and can be alcoholic or non-alcoholic (NAFLD). Chronic viral hepatitis may also show steatosis. The NAFLD variety is seen in obesity, diabetes, and dyslipidemic patients. Many patients are asymptomatic, but the condition can damage the liver and hepatomegaly is seen in more severe cases. The diagnosis requires a comparison of the liver parenchyma with the kidney parenchyma in the same view. This can be done in the subcostal views or in an intercostal view. The following is NAFLD in a longitudinal subcostal view with the liver enlarged caudad of the right kidney. A fatty liver appears brighter than normal, assuming the gain has been set correctly, but more importantly, the liver is definitely more echogenic than the kidney parenchyma. Severe steatosis reduces ultrasound penetration so the view of other liver structures may be compromised. A fatty liver can have focal hypoechoic areas (FHA) which are parts of the liver spared from the fatty infiltration. They are most common near the gallbladder and anterior to the portal vein. The problem with these areas is that they can suggest tumor, but they are usually not nodular in shape and the location helps with the diagnosis. The architecture shouldn’t change with such lesions and hepatic and portal veins should not be displaced. Short term follow-up with IMBUS is appropriate for equivocal cases, but MR is the definitive test to establish fat as the cause. 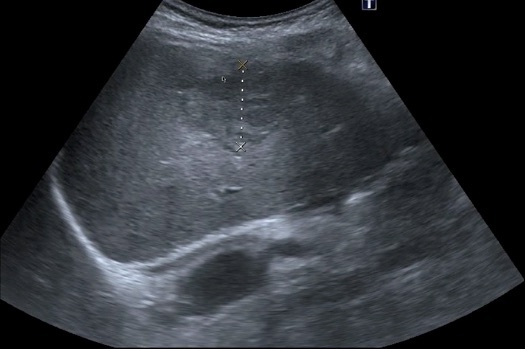 The following clip shows a few small FHA near the long axis gallbladder. 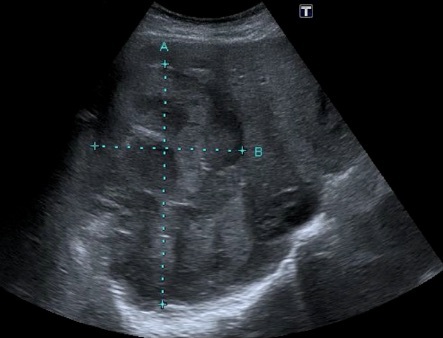 The following clip shows a few small FHA near the long axis gallbladder. Hepatic cirrhosis: The etiology of cirrhosis can’t be determined by IMBUS findings. 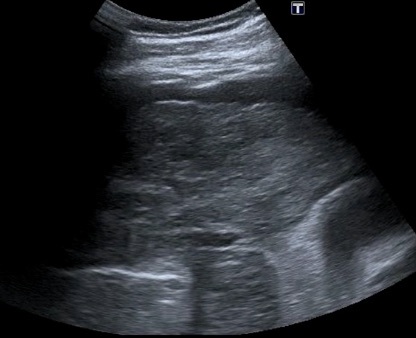 Advanced cases with prominent ascites and a shrunken liver with irregular borders are easy to identify. Earlier disease requires more careful attention to the liver contour, looking for subtle irregularity. The liver can be enlarged in early cirrhosis and ascites may not be present. The liver parenchyma becomes inhomogenous (irregular) as cirrhosis progresses and the HV become compressed. In contrast, the main PVs will become enlarged to greater than 12 mm in diameter as portal hypertension progresses. 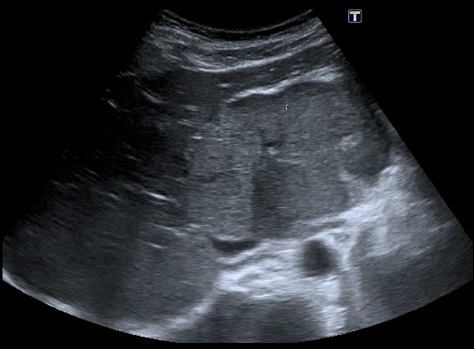 The following image shows a small amount of ascites at the top, an irregular liver contour, and some inhomogeneity of the liver parenchyma. The following overall guidelines adhere to the recommendations from the American College of Radiology. More detail about a few specific focal lesions is presented afterwards. Low Risk Patients: less than 40 years old, no known malignancy, no symptoms attributable to the liver, no known liver dysfunction, and no known disease with an increased risk of liver malignancy. Pure, simple cysts will be benign and do not need additional care. Strongly hyperechoic lesions with smooth borders in a low risk patient, particularly a woman, are highly likely to be hemangiomas and these should be followed in several months with IMBUS to verify no change. No formal imaging is then needed. Periodic follow up is not recommended but nothing would be lost with periodic IMBUS surveillance as part of a periodic health visit. All other liver lesions are problematic once they are greater than 0.5 cm in size. All of the criteria for risk of malignancy, which dictate the next steps in care, are based on CT findings. In low risk patients, single lesions under 0.5 cm are likely benign and biopsy is not performed on this size lesion anyway. Intermittent IMBUS follow up over the next 6-12 months will verify whether the size is changing. When the size is greater than or equal to 0.5 cm, it is time for a CT. In higher risk patients, more caution is necessary. Multiple lesions less than 0.5 cm can be metastatic disease. Even a single small lesion could be an early malignancy. The possibility of performing a PET/CT arises with these patients so consultation with radiology may be needed before ordering a CT.
Hemangioma: These lesions are common, benign, often multiple, and more often seen in women. They are usually asymptomatic and incidental, but can rarely cause troubles if they are large. Hemangiomas are hyperechoic with smooth borders that look like a “snowball” in the liver. Because they are filled with blood vessels they can give slight posterior acoustic enhancement. Hemangiomas occasionally are less hyperechoic and then CT/MR is usually needed to distinguish them from more dangerous lesions. Here is a typical hemangioma with subtle posterior acoustic enhancement. Cysts: These are common, benign, and single or multiple. With the gain set correctly these are anechoic, round or oval structures with a smooth outline. They should have posterior acoustic enhancement and may have lateral shadowing (edge artifacts). It is always a good idea to use CF or power Doppler to show that there is no blood flow in these structures. Here is a clip from a patient with multiple liver cysts, some of which were large. The cyst in this clip is completely anechoic with strong posterior acoustic enhancement and slight edge artifacts. Focal nodular hyperplasia: This is an unusual lesion seen more often in women, frequently in association with oral contraceptives. It is usually asymptomatic. The area is irregular in echogenicity and sometimes large. CF/power Doppler may show a small central artery. Unfortunately, malignancy is also a consideration with these lesions and CT/MR may be needed to differentiate them. Here is an ill-defined focal nodular hyperplasia lesion. The following is a larger, more well defined FNH lesion with greater concern for malignancy. Hepatocellular carcinoma (HCC): HCC occurs mostly in patients with certain types of chronic liver disease. Even if patients are being routinely screened with formal US for HCC, they might be seen in clinic with right upper quadrant complaints in between screenings and something could be seen. The lesions can be hypoechoic or hyperechoic, but are usually irregular areas. They are not as well defined as focal nodular hyperplasia. CT/MR is needed with this lesion. Here is a large and characteristically non-homogenous HCC. This second HCC image shows two smaller lesions on the left, one of which is more hypoechoic and the other more hyperechoic. Metastasis: These are usually multiple, variably sized, hypoechoic, non-homogenous, and without clear margins. A hypoechoic halo is a sign of malignancy. The following image shows multiple metastasis. Gallstones: Some gallstones can be missed by CT because they are isodense to bile. IMBUS will not miss these stones. Large gallstones are easy to see and don’t need further discussion here. Smaller gallstones, particularly those in the neck of the GB are a concern. The acronym S-I-N (for stone in the neck) reflects the difficulty of detecting these stones and the adverse consequences of missing them. For any gallstone, particularly in the neck, the posterior acoustic shadow can be the key finding. If the patient is not overly obese and there is uncertainty about a shadow, decrease the gain and the shadow may become more distinct. In general, gallstones should move with patient movement, but stones stuck in the neck may not move. Here is a gallstone in the neck of a GB. With any hint of a shadow from that region, look carefully in both short and long axis with adjusted gain. Other hyperechoic structures in the GB: Not every hyperechoic structure in a GB is a stone. Air can rarely get in the GB, but it rises to the top wall, with echogenic shadows coming off from the top. Polyps are hyperechoic, don’t move with position change, and don’t cause shadows. Here is a polyp defying gravity and casting no shadow. Movement of the patient also didn’t move this polyp. Structures that look like polyps in the GB fundus, but have a short comet tail below them, may be adenomyomatosis, a common degenerative/hyperplastic condition of the GB that isn’t an issue itself, but it seems to accompany chronic GB inflammation. This condition is fairly common in older patients and occasionally raises the possibility of GB carcinoma but the comet tails make this a benign lesion. Here is an example. Sludge can show as hyperechoic to the bile, but usually doesn't cause posterior acoustic shadows. A GB may be filled with sludge and be almost isoechoic with the liver, thus resembling a mass at the inferior liver. However, the wall of the GB will still be there. Rarely, what looks like sludge in the GB turns out to be carcinoma so consider all the clinical features of the patient. Here is a video of a GB mostly full of sludge. W-E-S Sign: The abbreviation stands for Wall-Echo-Shadow and refers to the situation of a GB collapsed around a good number of stones. There is a hyperechoic anterior wall, a thin hypoechoic layer representing the small residual lumen of the GB, and the hyperechoic beginning of the stones, below which is a very distinct posterior shadow. This is distinguished from a duodenum by noting that the outer layer of a duodenum is hypoechoic and the shadow is “dirty” with B-lines coming off periodically from duodenal contents. Here is a video of a good WES sign. Porcelain GB: This is rare and associated with carcinoma of the GB. Superficially it can resemble a WES sign but what is present is calcification of the GB wall. This creates a thin, calcified outer wall with a posterior shadow. There is no hypoechoic middle layer or a thicker beginning stone layer. Here is an example of a porcelain GB. Magnification on the top layer is probably needed to be sure it isn’t a WES sign. 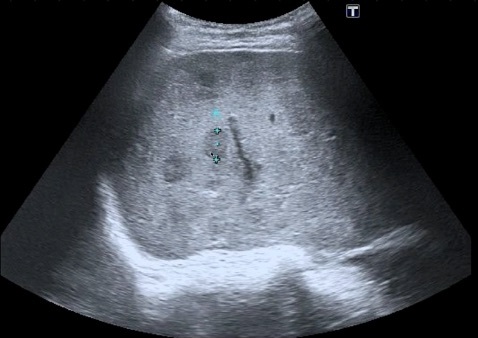 Cholecystitis: In the clinic setting, acalculous cholecystitis is rarely an issue, so the absence of gallstones or sludge makes cholecystitis extremely unlikely. If stones or sludge are present, carefully measure the thickness of the anterior GB wall interfacing the liver (short or long axis). Use a magnified view of an optimized GB image. As mentioned in the previous chapter, don’t measure a contracted GB wall. Normal wall thickness is less than 5 mm. In a thickened GB wall, there should be several layers with the outer layer hyperechoic. The hypoechoic middle layer is not pericholecystic fluid. Pericholecystic fluid is rare and would be beyond the outer wall of the GB. 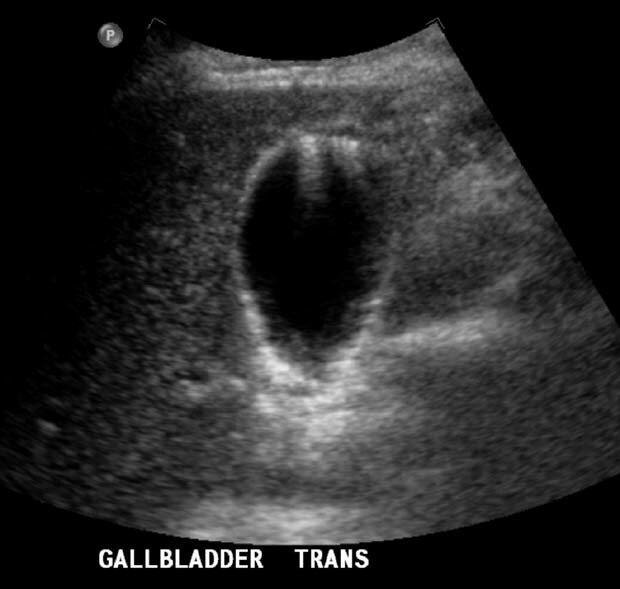 A thickened GB occurs in conditions other than cholecystitis (ascites, elevated right atrial pressure, and adenomyomatosis). Here is a magnified view of a patient with RUQ pain, gallstones, and a GB wall that measured greater than 5 mm and showed three layers with the outer layer hyperechoic. Murphy sign: To perform the sonographic Murphy sign correctly, find the GB in a transverse subcostal view and position the probe lightly on the fundus of the GB. Then have the patient inspire deeply while steady pressure is maintained on the probe. Observe the degree of patient discomfort with this maneuver. Then, move the probe a little to each side of the GB and repeat the inspiration and pressure, assessing the pain again. A positive sonographic Murphy sign is pain that is increased with inspiration specifically where the GB is lying. Common bile duct: A normal distal common bile duct (CBD) is < 6 mm in diameter but it gains 1 mm per decade in older patients and may be up to 10 mm in post-cholecystectomy patients. Here is a subcostal view showing an almost-long-axis IVC on the bottom, a partially-long-axis portal vein (PV) just anterior to the IVC, and the CBD just anterior to the PV. This CBD measured at the upper limit of normal. Sometimes the GB will also be in the view. In the following image, from posterior to anterior are the long-axis IVC, partially-long axis PV, CBD (little cursor), and the long-axis GB. Next is a view with a CBD that was over 1.0 cm in width. Enlarged CBD easily stand out and are often bigger than the PV. Hepatic bile duct: Obstruction of the biliary tree can be distal, as with a gallstone in the CBD or a cancer in the head of the pancreas or it can be proximal, as with cholangiocarcinoma or sclerosing cholangitis. Thus, just seeing a normal size CBD isn’t quite thorough enough. The hepatic ducts in the porta hepatis are also important. Get the porta hepatis view with the portal vein jumping over the IVC and rotate to optimize the bile duct running anterior to the PV. Normal HDs are several mm smaller than the CBD. Here is such a view in a patient with a dilated HD above the PV. If the distal CBD was normal in such a patient, proximal duct stones, cholangiocarinoma, and sclerosing cholangitis would be diseases to consider.